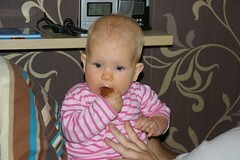 Daddy went to work in Holland for a week and when he came home he brought me biscuits. I've never had biscuits before but I made my very best attempt at eating them all the same! I think I'm going to like biscuits.